This year has plenty of amazing Black Friday and Cyber Monday sales to celebrate! Did you have a great Thanksgiving? I hope you did! As for the next few days, I know you'll be shopping up a storm checking out the best online deals at your go-to retailers, right? After you've stuffed your face full of yummy mashed potatoes, be sure to check out these top 20 cyber week sales. You won't want to miss out on some of the best sales of the entire year. Most stores will be honoring these deals from now up until Monday, so no matter how you plan on shopping whether it's online or in store, you have time to plan. These are the top 20 cyber week sales you need to know about. 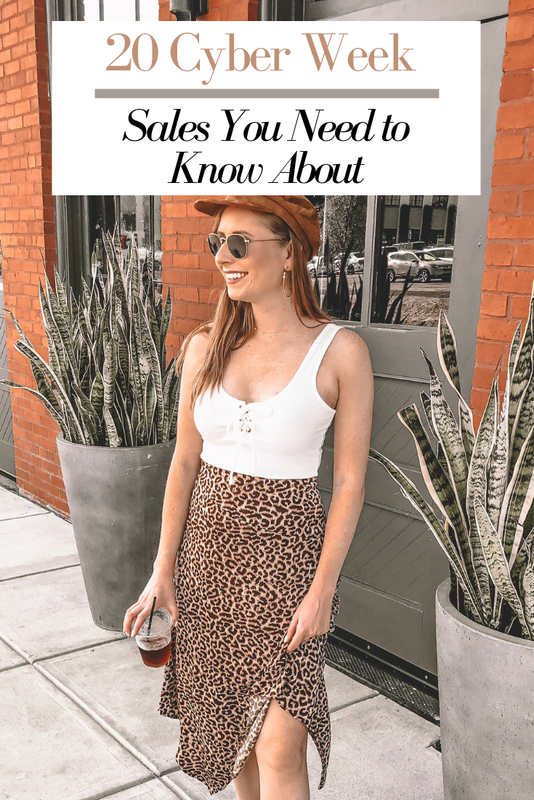 I've also included a few of my favorite items from select stores in this post, too. – 40% off everything with codeSHOPEARLY. Valid 11/20- 11/21. – 50% off your entire purchase. Valid through 11/24. –50% off entire site/store. Valid through 11/23. – 40% off your purchase with TOGETHER. Valid through 11/22. – 40-50% off sitewide withADD2CART. Through 11/24. – Yellow Friday Sale! Buy more, save more. 25% off $100+ 30% off $200+. Ends 11/26. – Up to 90% off sitewide. Use code BF25 for 24% OFF everything else! – Up to 60% off during “The Score” cyber week event! – Best-of brands up to 60% off. Additional 30% off clearance. –50% off your entire purchase. – 25% off sitewide withTHX25. – Buy more, save more.MORE18. I still need to check out the Old Navy and TopShop sales!